There is one invisible, formless spirit called Brahman which manifests itself inside every living thing. Hindus believe in one God, and they worship God through the many forms of gods and goddesses known as deities. The gods and goddesses, with all their gifts and strengths and personalities, help us to understand what God is like. By showing love and respect to the deities, we are showing love and respect to the One that is the Source of all. For example (and a really simplified one), Lakshmi is the bountiful provider and has gold coins falling from one of her hands. Brahma, the creator, has four heads so he can see oversee all of creation in the four directions. Ganesha is the remover of obstacles along our spiritual path. He has an elephant’s head, representing the power and strength of an elephant to get those obstacles out of our way. These specific qualities represented in the individual deities are all qualities that come from the One God, and are potentially manifested in each and every one of us. We focus on one of these deities in order to tap into that strength within ourselves. One way to show respect and devotion to God is called puja. Puja is a ceremony that can be performed every day or on special occasions, in a home or in a temple or shrine. One can have pictures or statues of the deities they are honouring in that particular puja. The place for the puja should be clean and comfortable – a place to meditate or pray. During the puja ceremony many mantras are chanted, which are prayers and verses from the Hindu holy books. These various mantras usually end in “samarpayami,” meaning “I have offered.” Many items are used in the ceremony, such as a bell, a copper pot of water, a diva lamp, and a pot of red kum kum powder. The worshipper then makes a series of offerings to God during the repetition of mantras. The offerings include pushpam (flowers), phalam (fruit), gandham (sandalwood paste), dhupam (incense), deepam (light), naivedyam (food), and jalam (water). Each item used in puja has a special symbolism or meaning. When we understand the meaning then the offering makes more sense and we become more sincere in the process. 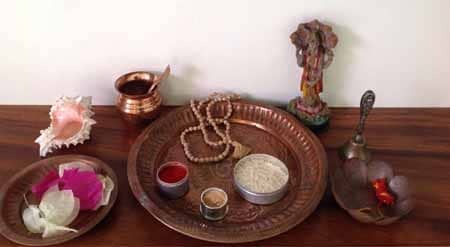 Puja thali: This is the tray on which the puja items are placed. Often participants in the puja will place in the tray special items such as rings or mala beads to be blessed during the puja. Water and rice are offered into the tray blessing these items. The bell is rung to let God know that you have come to worship. You invite God into the home. The bell produces an auspicious sound (and helps drown any inauspicious or irrelevant noises). The Conch shell is believed to make the purest sound – AUM – which is the sound of creation. Often it is used as a vessel to pour water into the Thali plate. The diva lamp is lit and moved around clockwise in circles to bring light to the shrine. This light is a symbol of God’s presence within us. It reminds us that even in our darkest hours, there is also light. The incense stick is lit and moved around the shrine in circles. This cleans the air and brings a lovely smell to the shrine for the gods and as it dissipates into the air, we are reminded that God is everywhere. Incense also represents the desires we possess. We burn these attachments before the Lord. Water is offered to the deity on a spoon or poured from a conch shell. This is to show respect. It symbolizes offering a drink of water, and also bathing or washing the feet of the deity, as if using the water from the sacred Ganges River. Rice is revered as a potent symbol of auspiciousness, prosperity and fertility because of its basic life-sustaining qualities. In the puja ritual it represents feeding the deities. Rice also symbolizes steadfastness and dedication and stands for peace. Kum Kum is a red powder is a symbol of loyalty, devotion and commitment. It symbolizes the emotions of the worshipper. Hindus use this to make a dot on the forehead of the statues or pictures of the gods. This is a sign of respect and devotion to the gods. They will also make a mark on their own forehead (at the ajna chakra) as a sign that God has blessed them. The dot, or bindi, is a means to worship one’s intellect. Worship of the intellect ensures that thoughts, speech, actions, habits and ultimately one’s character becomes pure. The ajna chakra involves balancing the higher and lower selves and trusting inner guidance. Its inner aspect relates to visual consciousness and clarity on an intuitive level. 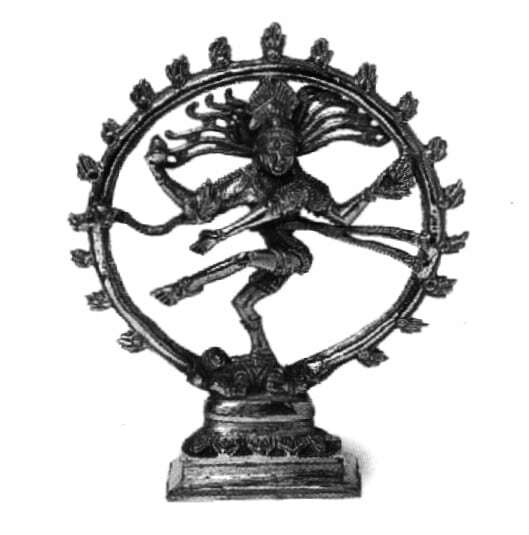 The bindi placed at this position is said to retain and enhance this energy, strengthening one’s concentration. Men generally apply the kum kum with the thumb and women with the ring-finger. Kum kum may also be applied by the priest when a puja is completed at a shrine or temple. Chandan (sandalwood paste): This is sometimes also placed on the forehead of the deities or participants, at the point of the third eye of wisdom. Sacred Red thread (kalava) symbolises offering new clothes to the deity after being bathed by the water. It chiefly symbolizes unity, helping to unite the congregation as one symbolic body during worship. The color red symbolizes purity, mastery and bravery. Flowers represent growth and beauty, and the good that has blossomed in us. Flowers vibrate a certain state of consciousness that represents purity. Flowers represent renouncing ones desires for enlightenment. As flowers are close to our heart, symbolically one is offering the soul or atman to the deity. Fruit: The offering of fruits signifies our detachment, surrender and self-sacrifice. The tree surrenders its attachment to the fruit, allowing it to release itself. By giving up something sweet we develop our self-control and cultivate inner strength. Prasad: Worshippers offer food for the gods to bless it, transforming any karma involved in acquiring the food into spiritual mercy. This blessed food is called ‘prashad’. After the food is offered to the deities, it is eaten by the worshippers. There are many different formats for pujas, including short forms that may only take 15 minutes and those that may last several hours. Every puja is special and sacred. May you be blessed with the opportunity to enjoy participation in this sacred event. Rhona, a good place to start is East Indian shops. They often have these items. And today, there are several places online that you can purchase from. I would be happy to help you with this.